I want to apologize for the delay in sending out this month's newsletter. It's been a crazy few weeks for me as I have made a decision that will impact both my personal and professional life. After 15 years of serving the citizens of Florida as a member of the Florida Climate Center, I have accepted another job position that will take me on a new career path. For the last 8 years, I've been the state coordinator for Florida CoCoRaHS, and its been a pleasure to welcome each one of you into the program. You have helped me prove the importance of citizen scientists and the impact they can make on the field. The program will continue on within the Florida Climate Center. Someone will take over my role and continue to serve you all after my departure at the end of the month. I will still be a part of the program, but as just an observer. I have mixed feelings stepping away from FSU... I'm excited about my new role, but sad to leave. It's always hard to say goodbye, but it's especially harder when you've made so many friends over the years. Thank you all for your pictures, stories, Emails, and for following me along on this crazy adventure over the last few years. I wish you all the best! Yet again, another month where CoCoRaHS has proven to be a valuable source of rainfall data. The localized rainfall event in the western Panhandle at the end of the month was captured by our observers, the National Weather Service, and a variety of media sources. At this point, you all must get tired of patting yourselves on the back... but keep doing it! The CoCoRaHS data was vital in helping determine where drought conditions persisted and eased during September. 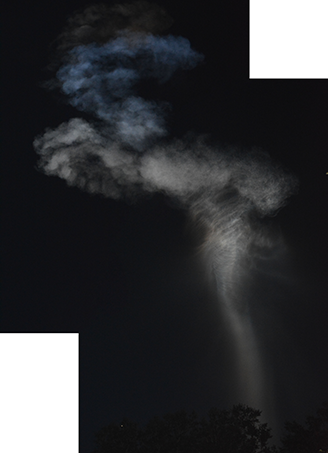 FL-VL-5 on 9/2/2015: "A thin line of showers formed quickly right along the coast early evening and dropped 0.24" Saw a remarkable comet-like vapor trail fanning out behind the Atlas V launch from the Cape this AM." " Wow. No rain here yesterday! A break in our extraordinarily rainy past several weeks. Not that I am complaining. This morning: 77 with 89% humidity. Up on the mountain -- 62, a mere 15 degrees cooler. 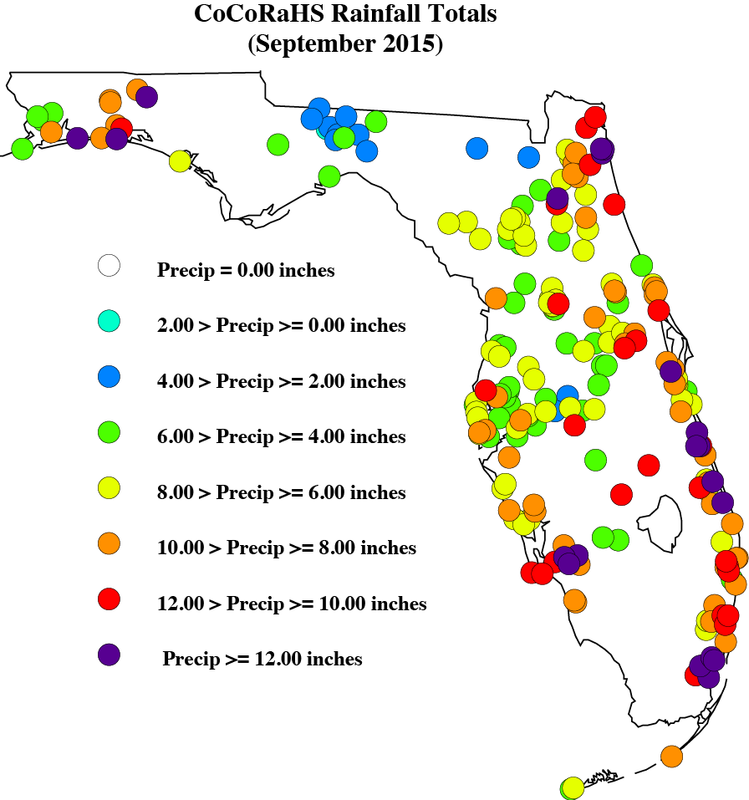 FL-ES-26 on 9/19/2015: "Only .32 rainfall in my gauge this month so far...The norm for the month is about 5.98 inches. After a wetter than normal winter, there has been a growing monthly rainfall deficit of 1-1.5 inches of rainfall since May. Its worse this month...No relief seen." " High 90 Low 70. Above average for this time of year. Partly sunny with clouds. Small, quick passing shower in the afternoon (without me noticing it even passed through). It's supposed to be back in the 90's Sun and Mon. Can we get on to fall already? " " Light rain at observation. Large tree limb damage during early evening. Very little thunder heard on 28 September Monday. " October 1st marks our 8th year of Florida CoCoRaHS! Some of you have been with us from the start and some of you are rather new to the program. Either way, thank you for counting every drop with me along the way. The data you've provided over the years has so much value and you all have contributed to the data analysis and research of precipitation patterns across the U.S. It's been a wonderful 7 years, and I hope you'll continue with the program for more years to come. 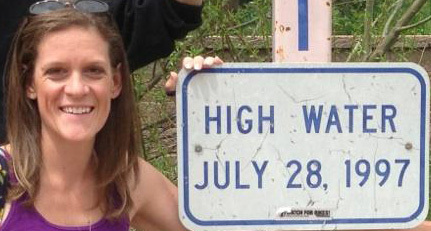 By now you should have noticed that the Message of the Day talks about the beginning of the 2015-2016 Water Year. Just a brief recap: the water year is the best consecutive 12-month period that spans the water storage and water usage part of the hydrologic cycle. While this is especially important out in the Western U.S., due to the water storage coming in the form of the winter snowpack, this cycle can be seen elsewhere across the country- just on a different form. For us here in Florida, the fall is typically a drier period for the state, however, the Climate Prediction Center is forecasting above normal precipitation through December. Here are a couple of observer photos that were shared with me during the month of September. First off, Ric shared this combined image of a couple of pictures he took of vapor trails in the early morning hours on the 1st. Bob from Brevard County sent in this picture of his rain gauge after rain on the 15th. 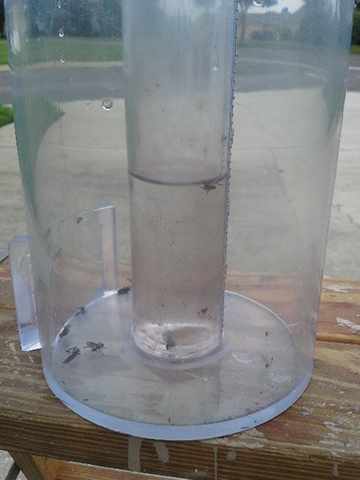 He mentioned, "The gauge read 0.25 inches of rain and 11 love bugs. Can anyone figure out how those bugs got into the outer canister? The gauge was properly assembled with the funnel on top." My guess is they crawled down the funnel and became trapped inside the gauge. I've seen this happen a few times when I have checked my gauge. And I'll close with this picture of my favorite beach destination in Florida... Fort Walton Beach. Portions of the western Florida Panhandle and South Florida reported above normal rainfall for the month, while the Big Bend and parts of the Peninsula observed below normal rainfall totals (Figure 1). 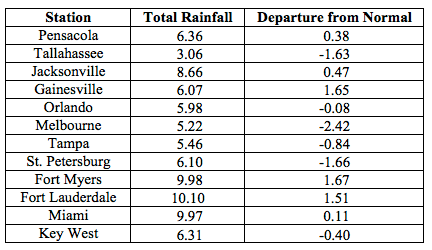 Departures from normal roughly ranged from -2.42" to 1.67" (Table 1), though localized parts of the state saw rainfall totals that were as much as 5.00" below normal to 8.00" above normal (Figure 1). September 2015 was the 7th wettest in Miami and the 10th wettest in Naples. There were multiple 24-hour precipitation records broken for the month (Table 2). At the end of August, nearly 40% of the state was experiencing abnormally dry (D0) or drought conditions, with the main concentration along the east coast of the state, the Big Bend, and the Florida Panhandle. 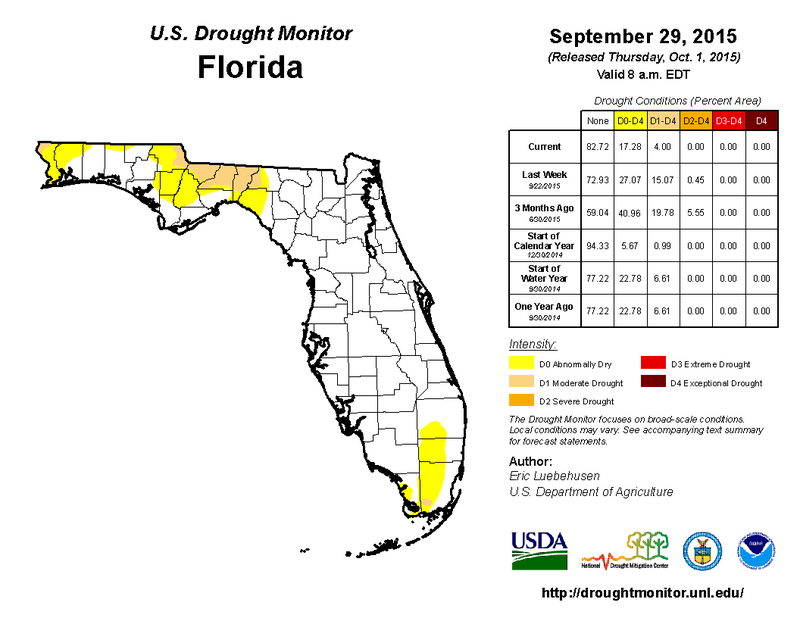 Extreme drought (D3) was being reported in interior portions of Broward, Dade, and Monroe counties. Rainfall at the beginning of the month helped ease some of the drought conditions along the Gold Coast, but dry persistent conditions in the northern part of the state caused an increase in the amount of area affected by moderate drought (D1). Consistent rains in South Florida caused the removal of D3 and the overall improvement of the drought-impacted region. However, drought conditions in the Panhandle continued due to the lack of rainfall. 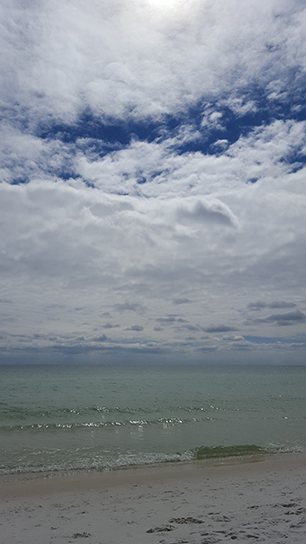 Toward the middle of the month, rainfall in portions of Franklin, Gulf and Wakulla counties removed all mention of drought, while the rains in South Florida improved the overall dry conditions, and reduction of D2 from the state. At the end of the month, an extremely localized rainfall event impacted the western Panhandle counties. The rainfall totals, between 6 and 12", prompted the removal of both D1 and D0 conditions from coastal areas in the region. Based on census data, the number of those impacted by drought during the month dropped from roughly 5.5 million Florida citizens to approximately 450,000 and drought conditions are currently reported in nearly 17% of the state. At the end of the month, the water level in Lake Okeechobee had increased to 14.73 ft., due to rainfall across the basin.